For hotels in Prague City Centre, pick-up from reception is free-of-charge (excluding hotels at Prague Airport). Pick-up from the hotel to the point of departure is not included in the overall duration of the tour. The agreed pick-up point and time are binding. No refund for missed pick-up/departure time. For tours that include drop-off at the hotel, the drop-off point must be announced by the guides at the latest by 12:00 noon on the date of the tour. The pick-up time from the hotel is not identical to the beginning of the trip and depends on the traffic situation and location of the hotel. Late pick-up from the hotel is not a reason for refund. Clients accommodated within walking distance of the point of departure may be picked-up by an employee of Prague Bus Tours, who will guide them on foot to the point of departure. For all tours, we guarantee only commentary in the English language; other languages (German, French, Italian, Spanish, Russian) are possible upon request. Commentary is done bilingually. In historical buildings we guarantee only English language commentary. For the rest of the languages, the client shall be provided with a text guide book. Other languages may be provided only if a local guide conversant in the given language is available. The client is obliged to stay with the group and obey the instructions of the guide. Prague Bus Tours shall not be liable for items forgotten in the buses, restaurants or visited buildings. On public holidays (Christmas, New Year’s Eve, etc. ), Prague Bus Tours may offer some tours with a special programme at prices other than those shown on the leaflet. Prague Bus Tours does not guarantee the speed or stability of the Wi-Fi connection on-board its buses, the network parameters may change depending on the availability of the signal during travel. The client shall receive the necessary Wi-Fi log-in data from the guide or driver upon request. The Wi-Fi connection is only available within the Czech Republic. Prague Bus Tours reserves the right to change the route of the sightseeing cruise in case of high water. Tour T6 Karlstejn Castle Tour does not include a visit to the Chapel of the Holy Cross. Children aged 0 to 2 years free-of-charge without entitlement to a seat. The child price applies to children aged 3 to 11. The student/senior price applies to students aged 12–26 upon presentation of their valid student cards and seniors aged 65+. 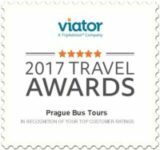 All complaints and reminders must be solved with the staff of Prague Bus Tours immediately at the end of the tour. It is possible to cancel a tour free-of-charge 24 hours before departure. Prague Bus Tours reserves the right to change the programme and price in case of unexpected changes in the visiting hours of the buildings, traffic restrictions, organisation of cultural events and unexpected natural conditions. T12 Prague Dinner Cruise with music – We can not guarantee type of boats. Complimentary bottled water is offered only during tours T2–T10A. All Hop On – Hop Off tours are subject to special conditions which you will find in the separate Hop On – Hop Off website. Prague Bus Tours reserves the right to change.